Perhaps unsurprisingly, then, all around the world, how best to teach children to read is one of the most publicized and contested fields of research. Now, answering the need for an authoritative reference work to make sense of this vast and disputatious body of thought, and the continuing explosion in research output, Routledge announces a new title in its Major Themes in Education series. In four volumes, Reading brings together in one easy-to-use ‘mini library’ foundational major works and the very best cutting-edge contributions. 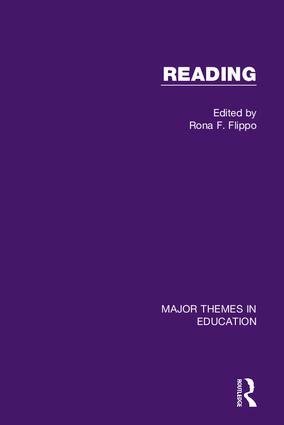 With comprehensive introductions to each volume, newly written by the editor, Rona Flippo, Reading is an essential work of reference. It is destined to be valued by literacy specialists and scholars working in related areas—as well as by educational policy-makers and professionals—as a vital one-stop research tool. 2. Gray, W. S. ‘The importance of intelligent silent reading’ The Elementary School Journal, 24, 5, 1924, 348-356. 3. Robinson, F. P. ‘Can college freshmen in the lowest tenth in reading be aided scholastically?’ School and Society, 34, 886, 1931, 843-846. 4. Tinker, M. A. ‘Recent trends in reading instruction’ The Journal of Educational Research, 36, 6, 1943, 468-480. 5. Dale, E., & Chall, J. S. ‘The concept of readability’ Elementary English, 26, 1, 1949, 19-26. 6. Spache, G. ‘A new readability formula for primary-grade reading materials’ The Elementary School Journal, 53, 7, 1953, 410-413. 7. Dolch, E. W. ‘Do reading tests test reading?’ Elementary English, 31, 4, 1954, 200-204. 8. Betts, E. A. ‘Research on reading as a thinking process’ The Journal of Educational Research, 50, 1, 1956, 1-15. 9. Staiger, R. C. ‘How are basal readers used?’ Elementary English, 35, 1, 1958, 46-49. 10. McCullough, C. M. ‘Context aids in reading’ The Reading Teacher, 11, 4, 1958, 225-229. 11. Pauk, W. ‘Study skills and scholastic achievement’ The Reading Teacher, 19, 3, 1965, 180-182, 186. 12. Goodman, K. S. ‘Reading: A psycholinguistic guessing game’ Journal of the Reading Specialist, 6, 4, 1967, 126-135. 13. Clay, M. M. ‘A syntactic analysis of reading errors’ Journal of Verbal Learning and Verbal Behavior, 7, 2, 1968, 434-438. 14. Bormouth, J. R. ‘The Cloze readability procedure’ Elementary English, 45, 4, 1968, 429-436. 15. Manzo, A. V. ‘The ReQuest procedure’ Journal of Reading, 13, 2, 1969, 123-126,163. 16. Singer, H. (1970) ‘Research that should have made a difference’ Elementary English, 47, 1, 27-34. 17. Weber, R.-M. ‘A linguistic analysis of first-grade reading errors’ Reading Research Quarterly, 5, 3, 1970, 427-451. 18. Smith, F., & Goodman, K. S. ‘On the psycholinguistic method of teaching reading’ The Elementary School Journal, 71, 4, 1971, 177-181. 19. Chomsky, C. ‘Write first, read later’ Childhood Education, 47, 6, 1971, 296-299. 20. Bransford, J. D., & Johnson, M. K. ‘Contextual prerequisites for understanding: Some investigation of comprehension and recall’ Journal of Verbal Learning and Verbal Behavior, 11, 6, 1972, 717-726. 21. Eanet, M. G., & Manzo, A. V. ‘REAP- A strategy for improving reading/writing/study skills’ Journal of Reading, 19, 8, 1976, 647-652. 22. Pressley, M. ‘Mental imagery helps eight-year olds remember what they read’ Journal of Educational Psychology, 68, 3, 1976, 355-359. 23. Anderson, R. C., Reynolds, R. E., Shallert, D. L., & Goetz, E. T. ‘Frameworks for comprehending discourse’ American Educational Research Journal, 14, 4, 1977, 367-381. 24. Olson, D. ‘From utterance to text: The bias of language in speech and writing’ Harvard Educational Review, 47, 3, 1977, 257-281. 25. Allington, R. L. ‘If they don't read much, how they ever gonna get good?’ Journal of Reading, 21, 1, 1977, 57-61. 26. Fry, E. ‘Fry's readability graph: Clarifications, validity, and extension to level 17’ Journal of Reading, 21, 3, 1977, 242-252. 29. Anderson, R. C., Spiro, R. J., & Anderson, M. C. ‘Schemata as scaffolding for the representation of information in connected discourse’ American Educational Research Journal, 15, 3, 1978, 433-440. 30. Goodman, Y. M. (1978) ‘Kid Watching: An alternative to testing’ National Elementary Principal, 57, 4, 1978, 41-45. 31. Samuels, S. J. ‘The method of repeated readings’ The Reading Teacher, 32, 4, 1979, 403-408. 32. Pearson, P. D., Hansen, J., & Gordon, C. ‘The effect of background knowledge on young children's comprehension of explicit and implicit information’ Journal of Literacy Research, 11, 3, 1979, 201-209. 33. Johns, J. L. ‘First graders' concepts about print’ Reading Research Quarterly, 1980, 529-549. 34. Tierney, R. J., & LaZansky, J. ‘The rights and responsibilities of readers and writers: A contractual agreement’ Language Arts, 57, 6, 1980, 606-613. 35. Goodman, K., & Goodman, Y. M. ‘To err is human’ New York University Education Quarterly, 12, 4, 1981, 14-19. 36. Heath, S. B. ‘What no bedtime story means: Narrative skills at home and school’ Language in Society, 11, 1, 1982, 49-76. 37. Applebee, A. N., & Langer, J. A. ‘Instructional scaffolding: Reading and writing as natural activities’ Language Arts, 60, 2, 1983, 168-175. 38. Graves, D., & Hansen, J. ‘The author’s chair’ Language Arts, 60, 2, 1983, 176-183. 39. Cranney, A. G. ‘Two decades of adult reading programs: Growth, problems, and prospects’ Journal of Reading, 26, 5, 1983, 416-422. 40. Perfetti, C. A. ‘Reading acquisition and beyond: Decoding includes cognition’ American Journal of Education, 93, 1, 1984, 40-60. 41. Deford, D. E. ‘Validating the construct of theoretical orientation in reading instruction’ Reading Research Quarterly, 20, 3, 1985, 351-367. 42. Morrow, L. M. ‘Reading and retelling stories: Strategies for emergent readers’ The Reading Teacher, 38, 9, 1985, 870-875. 43. Alvermann, D. E., Smith, L. C., & Readence, J. E. ‘Prior knowledge activation and the comprehension of compatible and incompatible text’ Reading Research Quarterly, 20, 5, 1985, 420-436. 44. Allen, J. ‘Inferential comprehension: The effects of text source, decoding ability, and mode’ Reading Research Quarterly, 20, 5, 1985, 603-615. 45. Johnston, P. H., & Winograd, P. N. ‘Passive failure in reading’ Journal of Reading Behavior, 17, 4, 1985, 279-300. 46. Ogle, D. M. ‘KWL: A teaching model that develops active reading of expository text’ The Reading Teacher, 39, 6, 1986, 564-570. 47. Raphael, T. E. ‘Teaching Question Answer Relationships, revisited’ The Reading Teacher, 39, 6, 1986, 516-522. 48. Palincsar, A. S., & Brown, A. L. ‘Interactive teaching to promote independent learning from text’ The Reading Teacher, 39, 8, 1986, 771-777. 49. Durkin, D. ‘Influences on basal reader programs’ The Elementary School Journal, 87, 3, 1987, 331-341. 50. Valencia, S., & Pearson, P. D. ‘Reading assessment: Time for a change’ The Reading Teacher, 40, 8, 1987, 726–732. 51. Juel, C. ‘Learning to read and write: A longitudinal study of 54 children from first through fourth grades’ Journal of Educational Psychology, 80, 4, 1988, 437-447. 52. Chall, J. S. ‘Learning to read: The great debate 20 years later: A response to "debunking the great phonics myth"’ Phi Delta Kappan, 70, 7, 1989, 521-538. 53. Flood, J., & Lapp, D. ‘Reporting reading progress: A comparison portfolio for parents’ The Reading Teacher, 42, 7, 1989, 508–514. 54. Karnowski, L. ‘Using LEA with process writing’ The Reading Teacher, 42, 7, 1989, 462-465. 55. Rasinski, T. V. ‘Fluency for everyone: Incorporating fluency instruction in the classroom’ The Reading Teacher, 42, 9, 1989, 690-693. 56. Valencia, S. ‘A portfolio approach to classroom reading assessment: The whys, whats, and hows’ The Reading Teacher, 43, 4, 1990, 338-340. 57. Pikulski, J. J. ‘The role of tests in a literacy assessment program’ The Reading Teacher, 43, 9, 1990, 686--688. 58. Freebody, P., & Luke, A. ‘‘Literacies’ programs: Debates and demands in cultural context’ Prospect: Australian Journal of TESOL, 5, 3, 1990, 7-16. 59. Taylor, B. M., Frye, B. J., & Maruyama, G. M. ‘Time spent reading and reading growth’ American Educational Research Journal, 27, 2, 1990, 351-362. 61. Sulzby, E. ‘Assessment of emergent literacy: Storybook reading’ The Reading Teacher, 44, 7, 1991, 498-500. 62. Dole, J. A., Duffy, G. G., Roehler, L. R., & Pearson, P. D. ‘Moving from the old to the new: Research on reading comprehension instruction’ Review of Educational Research, 61, 2, 1991, 239-264. 63. Anderson, R. C., & Nagy, W. E. ‘The vocabulary conundrum’ American Educator, 16, 4, 1992, 14-18, 44-47. 64. Farr, R. ‘Putting it all together: Solving the reading assessment puzzle’ The Reading Teacher, 46, 1, 1992, 26–37. 65. Cunningham, P. M., & Cunningham, J. W. ‘Making words: Enhancing the invented spelling-decoding connection’ The Reading Teacher, 46, 2, 1992, 106–115. 66. Stahl, S. A. ‘Saying the "p" word: Nine guidelines for exemplary phonics instruction’ The Reading Teacher, 45, 8, 1992, 618-625. 67. Calfee, R. C., & Perfumo, P. ‘Student portfolios: Opportunities for a revolution in assessment’ Journal of Reading, 36, 7, 1993, 532-537. 68. Purcell-Gates, V. ‘I ain't never read my "own" words before’ Journal of Reading, 37, 3, 1993, 210-219. 69. Reutzel, D. R., & Hollingsworth, P. M. ‘Effects of fluency training on second graders’ reading comprehension’ The Journal of Educational Research, 86, 6, 1993, 325-331. 70. Strickland, D. S. ‘Reinventing our literacy programs: Books, basics, balance’ The Reading Teacher, 48, 4, 1994/1995, 294-302. 71. Turner, J., & Paris, S. G. ‘How literacy tasks influence children's motivation for literacy’ The Reading Teacher, 48, 8, 1995, 662-673. 72. Cambourne, B. ‘Toward an educationally relevant theory of literacy learning: Twenty years of inquiry’ The Reading Teacher, 49, 3, 1995, 182-190. 73. Goodman, Y. M. ‘Revaluing readers while readers revalue themselves: Retrospective miscue analysis’ The Reading Teacher, 49, 8, 1996, 600–609. 74. Gambrell, L. B. ‘Creating classroom cultures that foster reading motivation’ The Reading Teacher, 50, 1, 1996, 14–25. 75. Shannon, P. ‘Poverty, literacy, and politics: Living in the USA’ Journal of Literacy Research, 28, 3, 1996, 429-449. 76. Graves, M. F., & Dykstra, R. ‘Contextualizing the first-grade studies: What is the best way to teach children to read?’ Reading Research Quarterly, 32, 4, 1997, 342–344. 77. Willis, A. I., & Harris, V. J. ‘Expanding the boundaries: A reaction to the first-grade studies’ Reading Research Quarterly, 32, 4, 1997, 439–445. 78. Tierney, R. J. ‘Literacy assessment reform: Shifting beliefs, principled possibilities, and emerging practices’ The Reading Teacher, 51, 5, 1998, 374–390. 79. Au, K. H. ‘Social constructivism and the school literacy learning of students of diverse backgrounds’ Journal of Literacy Research, 30, 2, 1998, 297-319. 80. Flippo, R. F. ‘Points of agreement: A display of professional unity in our field’ The Reading Teacher, 52, 1, 1998, 30-40. 81. Cassidy, J., & Wenrich, J. K. ‘Literacy research and practice: What's hot, what's not, and why’ The Reading Teacher, 52, 4, 1998/1999, 402-406. 82. Duffy, G. G., & Hoffman, J. V. ‘In pursuit of an illusion: The flawed search for a perfect method’ The Reading Teacher, 53, 1, 1999, 10-16. 83. Flippo, R. F. ‘Redefining the reading wars: The war against reading researchers’ Educational Leadership, 57, 2, 1999, 38-41. 84. Duke, N. K. ‘3.6 minutes per day: The scarcity of informational texts in first grade’ Reading Research Quarterly, 35, 2, 2000, 202-224. 85. Fitzgerald, J., & Shanahan, T. ‘Reading and writing relations and their development’ Educational Psychologist, 35, 1, 2000, 39-50. 86. Neuman, S. B., & Celano, D. ‘Access to print in low‐income and middle‐income communities: An ecological study of four neighborhoods’ Reading Research Quarterly, 36, 1, 2001, 8-26. 89. Bean, R. M., Swan, A. L., & Knaub, R. ‘Reading specialists in schools with exemplary reading programs: Functional, versatile, and prepared’ The Reading Teacher, 56, 5, 2003, 446–455. 91. Guthrie, J. T., Wigfield, A., Barbosa, P., Perencevich, K. C., Taboada, A., Davis, M. H., Scafiddi, N. T., & Tonks, S. ‘Increasing reading comprehension and engagement through concept-oriented reading instruction’ Journal of Educational Psychology, 96, 3, 2004, 403-419. 92. Hall, L. A. ‘Teachers and content area reading: Attitudes, beliefs and change’ Teaching and Teacher Education, 21, 4, 2005, 403-414. 93. Rosenblatt, L. M. ‘Literature--SOS!’ Voices from the Middle, 12, 3, 2005, 34-38. 94. Paris, S. G. ‘Reinterpreting the development of reading skills’ Reading Research Quarterly, 40, 2, 2005, 184-202. 95. Klingner, J. K., & Edwards, P. A. ‘Cultural considerations with response to intervention models’ Reading Research Quarterly, 41, 1, 2006, 108-117. 96. Blachowicz, C. L., Fisher, P. J., Ogle, D., & Watts‐Taffe, S. ‘Vocabulary: Questions from the classroom’ Reading Research Quarterly, 41, 4, 2006, 524-539. 97. Blanton, W. E., Wood, K. D., & Taylor, D. B. (2007) ‘Rethinking middle school reading instruction: A basic literacy activity’ Reading Psychology, 28, 1, 2007, 75-95. 98. Pearson, P. D. ‘An endangered species act for literacy education’ Journal of Literacy Research, 39, 2, 2007, 145-162. 99. Risko, V. J., & Walker‐Dalhouse, D. ‘Tapping students' cultural funds of knowledge to address the achievement gap’ The Reading Teacher, 61, 1, 2007, 98-100. 100. Shanahan, T., & Shanahan, C. ‘Teaching disciplinary literacy to adolescents: Rethinking content-area literacy’ Harvard Educational Review, 78, 1, 2008, 40-59. 101. Flippo, R. F., Holland, D. D., McCarthy, M. T., & Swinning, E. A. ‘Asking the right questions: How to select an Informal Reading Inventory’ The Reading Teacher, 63, 1, 2009, 79-83. 102. Vaughn, S., Cirino, P. T., Wanzek, J., Wexler, J., Fletcher, J. M., Denton, C. D., Barth, A., Romain, M. & Francis, D. J. ‘Response to intervention for middle school students with reading difficulties: Effects of a primary and secondary intervention’ School Psychology Review, 39, 1, 2010, 3-21. 103. Harper, H., Bean, T. W., & Dunkerly, J. ‘Cosmopolitanism, globalization and the field of adolescent literacy’ Comparative and International Education, 39, 3, 2010, 1-13. 106. Hinchman, K. A., & Moore, D. W. ‘Close reading: A cautionary interpretation’ Journal of Adolescent & Adult Literacy, 56, 6, 2013, 441-450. 107. Leu, D. J., Forzani, E., Rhoads, C., Maykel, C., Kennedy, C., & Timbrell, N. ‘The new literacies of online research and comprehension: Rethinking the reading achievement gap’ Reading Research Quarterly, 50, 1, 2014, 37-59. 109. Reutzel, D. R., & Mohr, K. A. ‘50 years of Reading Research Quarterly (1965–2014): Looking back, moving forward’ Reading Research Quarterly, 50, 1, 2014, 13-35. 110. Lewis-Spector, J. ‘The larger purpose: Literacy instruction that prepares students to become productive, engaged citizens’ Reading Today, 32, 6, 2015, 6-7. 111. Cervetti, G. N., Hiebert, E. H., Pearson, P. D., & McClung, N. A. ‘Factors that influence the difficulty of science words’ Journal of Literacy Research, 47, 2, 2015, 1-33. 112. Cassidy, J., Grote-Garcia, S., & Ortlieb, E. ‘What’s hot in 2016: Recognizing new trends and celebrating 20 years of data’ Literacy Today, 33, 2, 2015, 12-16. 113. Gambrell, L. B. ‘Getting students hooked on the reading habit’ The Reading Teacher, 69, 3, 2015, 259-263. 114. Afflerbach, P. ‘Reading assessment: Looking ahead’ The Reading Teacher, 69, 4, 2016, 413-419. Rona F. Flippo, Professor, University of Massachusetts Boston, USA, is author/editor of 18 previous books, with two more currently in progress, and over 100 articles and chapters. Dr. Flippo serves professional reading associations and the reading profession at- large on editorial and director boards. Most recently she has served an elected term on the Board of Directors of the International Literacy Association (formerly the International Reading Association), 2012-2015.